Shi X & Yankell S.L. A New Laboratory Method to Evaluate Whitening Toothpastes. (2016) J Dent Oral Care 2(2): 1- 5. Purpose: During the conduct of standard tooth brushing studies with toothpaste products it was observed that artificial plaque whitening occurred where there was no toothbrush bristle contact. The purpose of this research was to assess artificial plaque whitening after the application of commercially available whitening toothpastes, without brushing. Methods: Six toothpastes with labeled whitening claims were evaluated. Each toothpaste was placed into a prophylaxis cup, inverted onto the artificial plaque substrate and topped with a 50 g weight. The toothpaste products were evaluated at full strength and after diluting 1:3 with water. A Whitening Index (WI) was determined by visually evaluating the increase in whitening of the plaque using a 0 - 2 scale. Significant differences between the toothpastes were determined using t-tests, assuming unequal variances. Results: Two toothpastes containing hydrogen peroxide had significantly greater WI scores compared to two calcium peroxide-containing toothpastes and two peroxide-free toothpastes (p < 0.001) when tested at full strength or diluted 1:3. The two toothpastes containing calcium peroxide, tested undiluted, exhibited significantly higher whitening means than the peroxide-free whitening toothpastes (p < 0.05). Clinical Significance: It is important for dental health providers to have scientific evidence of efficacy for whitening toothpastes so as to advise patients as to which product will best meet their needs for tooth whitening. A new method has been developed and has been shown to detect significant differences in whitening scores between toothpastes containing different peroxide compounds and peroxide-free products. Pellicle is a thin protein layer which begins to form on teeth immediately after a dental prophylaxis. Smoking, intake of chromagens from foods and beverages and the prolonged use of antimicrobial prescription products containing chlorhexidine, are examples of factors that can contribute to the development of extrinsic tooth stain and discolored plaque and pellicle[1-3]. The perception that whitening toothpaste products are more abrasive than ordinary toothpastes has not been documented. In several published studies, the abrasiveness of whitening products has been less than other products tested[4-7]. Bleaching or oxidizing agents have a long history as toothpaste components associated with tooth whitening. Compounds in this category include calcium peroxide, carbamide peroxide and hydrogen peroxide. Tissue interactions and the potential to enable microbial overgrowths have been stated as concerns with peroxide-containing toothpastes, but these problems have not been reported with the low peroxide concentrations in over-the-counter products. There are a wide range of laboratory procedures to evaluate whitening toothpaste agents and formulated products[9-14]. Several toothpaste whitening assays involve the cycling of a substrate through chromogenic mixtures with various components such as saliva, mucins, coffees, teas, microbial broths, etc. Substrates have included acrylic disks, hydroxyapatite slabs and extracted human or bovine teeth. In these studies the effectiveness of whitening agents in preventing or reducing extrinsic stain has been monitored instrumentally such as with the L*a*b* scale or using shade guide comparisons. In most of these studies the abrasiveness of the toothpaste and the effect of complex phosphates therein, rather than peroxide agents in the formulation, account for most of the stain removal efficacy. The artificial plaque substrate developed in our laboratory has been used to evaluate polishing and the abrasion potential of toothpastes. These were assessed after using a standard number of tooth brushing strokes by determining color changes on a comparative scale in increments of 0.25, where the color score went from black, scored as 0, to white, a score of 2.0. With increased brushing strokes, scores increased from white, a score of 2.0 to red, a score of 4.0[15-18]. In a number of studies, it was noted that hydrogen peroxide-containing toothpastes produced areas of whitening of the artificial plaque on contact with the substrate and where there was no toothbrush bristle contact. This led to consideration of the use of this substrate to assess whitening from toothpastes when applied directly to the artificial plaque surface without brushing. Therefore, the purpose of this research was to determine whether marketed whitening toothpastes would demonstrate reproducible differences in their potential to whiten an artificial plaque surface without brushing. 1. Two toothpastes containing hydrogen peroxide and baking soda : Arm & Hammer® Advance White, coded AH1 and Arm & Hammer® Complete Care Whitening, AH2, (Church & Dwight Co., Inc., Princeton, NJ, USA). 2. Two toothpastes containing calcium peroxide and baking soda: Colgate® Whitening Oxygen Bubbles Baking Soda & Peroxide, CP1, (Colgate-Palmolive Company, New York, NY, USA) and Crest® Whitening Baking Soda & Peroxide, PG1, ( Procter & Gamble Co. , Cincinnati,OH, USA). 3. Colgate® Total Whitening, CP2, (Colgate-Palmolive Company, New York, NY, USA). 4. Crest® + Scope® Whitening, PG2, (Procter & Gamble Co., Cincinnati,OH, USA). All the toothpastes were evaluated undiluted (full strength) and the peroxide-containing products were further evaluated as 1:3 slurries in water. The artificial plaque substrate was cut into 1 X 10 cm strips and hydrated by placing into tap water for 1.5 minutes. After removal, it was placed on a water-moistened laboratory table and the surface was blotted with a paper towel. Six wells were prepared from prophy cups (Nupro Revolv Disposable Prophy Pack, Dentsply Professional, York, PA, USA), by affixing them, 1.5 cm apart, to a 50 gm weight base, using Epoxy-Patch (Dexter Corp., Olean, NY, USA). The tests were replicated four times for each of six tubes of each toothpaste for a total of twenty four replications for each product under each test condition. Prior to testing, approximately 1 to 2 inches of toothpaste were expelled and discarded. An additional 1 to 2 inches of toothpaste were then dispensed from the tube for each set of tests and the toothpaste was mixed well. Each prophy cup was filled with test toothpaste with excess being skimmed from the top. 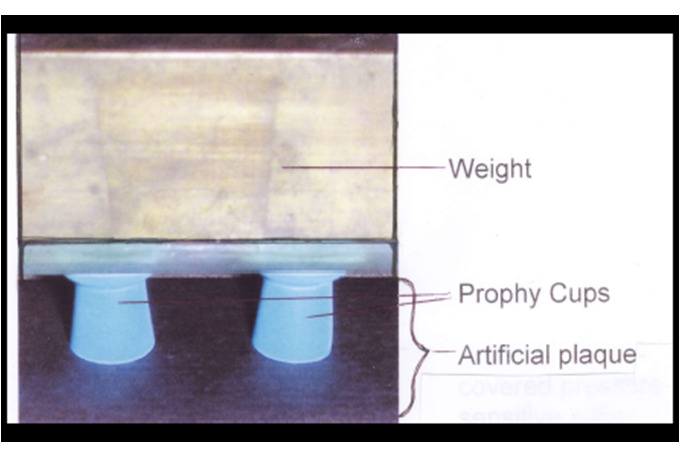 The cup was inverted onto the substrate and a 50 g weight was applied to the top of the prophy cup to assure consistent contact between the toothpaste and artificial plaque substrate. 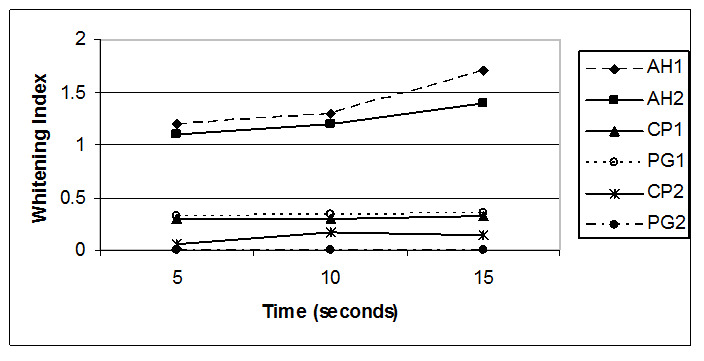 (Figure 1) Tests were replicated four times for each of six tubes of each toothpaste for a total of twenty four replications for each product. After a contact time of 5, 10 or 15 seconds for the full strength evaluations and 5, 10, 15 or 30 seconds for the 1:3 slurries, the prophy cups were removed from the substrate. The substrate was immediately and thoroughly rinsed under tap water to remove residual toothpaste and then allowed to air dry. The artificial plaque test substrate was initially black but became whitened on exposure to several of the toothpaste products. Whitening scores were developed using a published color comparative scale ranked from 0 to 2.0 and is expressed as the Whitening Index. The same examiner performed all evaluations. Data was analyzed using the t-test assuming unequal variances. A level of (p < 0.05) was the minimum used for statistical significance. The Whitening Index (WI) means obtained for the undiluted toothpastes applied for 5, 10 and 15 seconds after application to the artificial plaque test substrate are presented in Table 1 and Figure 2. As shown by the WI means, the toothpastes containing hydrogen peroxide, AH1 and AH2, produced significantly higher mean scores than the other toothpastes tested (p < 0.001). *AH1= Arm & Hammer® Advance White , AH2 = Arm & Hammer® Complete Care Whitening, CP1 = Colgate® Whitening Oxygen Bubbles Baking Soda & Peroxide,, PG1 = Crest® Whitening Baking Soda & Peroxide , CP2 = Colgate® Total Whitening , PG2 = Crest® + Scope® Whitening. The WI produced by both AH1 and Ah2 toothpastes increased linearly with time. The calcium peroxide-containing toothpastes, CP1 and PG1, exhibited a slightly increasing WI means as the application time increased. 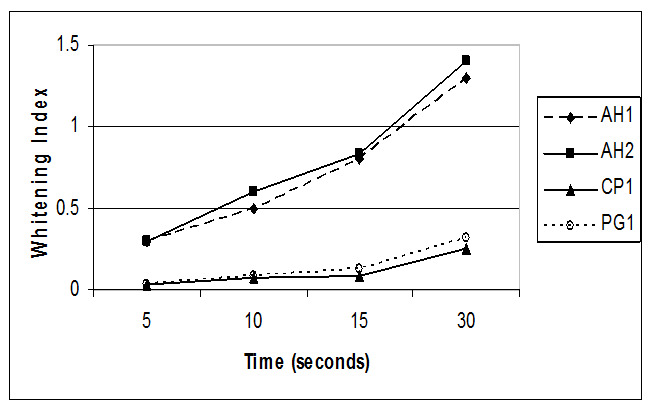 The mean WI values for these products were significantly higher than CP2 and PG2 whitening toothpaste products that did not contain peroxide compound (p < 0.05) The CP2 toothpaste exhibited a low WI value at the 5 second treatment time which increased slightly after 10 and 15 seconds of application. In this assay, the PG2 toothpaste had no activity at any of the application times tested. The whitening efficacy results of peroxide-containing toothpastes diluted 1:3 are summarized in Table 2 and Figure 3. As with the WI means, the undiluted hydrogen peroxide- containing toothpastes, AH1 and AH2, had higher WI scores than the two calcium peroxide-containing toothpastes tested (p < 0.001). The WI mean scores for both AH1 and AH2 toothpastes increased over time. The 1:3 dilutions of the calcium peroxide-containing toothpastes, CP1 and PG1, had low WI means which increased as application time increased. Table 2: Whitening Index Means for Toothpaste Products Diluted 1:3. AH1= Arm & Hammer® Advance White , AH2 = Arm & Hammer®, Complete Care Whitening, CP1 = Colgate® Whitening Oxygen Bubbles Baking Soda & Peroxide,, PG1 = Crest® Whitening Baking Soda & Peroxide. The Subgingival Access Efficacy (SAE) laboratory assay, which evaluates the ability of toothbrush bristles to penetrate below simulated gingiva and remove artificial plaque, has been used in our laboratory since 1998. A flat trim, soft texture toothbrush, approved by The American Dental Association, is used as a control standard in these studies[20-23]. While these control products have been documented to have minimal values in the SAE assay, it was observed that increased efficacy occurred when a standard toothbrush was used with a hydrogen-peroxide containing toothpaste. Microscopic evaluation of the plaque substrate showed no removal of the surface layer(s) that occurs with tooth brushing. Increased SAE values were related to a chemical interaction with the artificial plaque to produce lightening / whitening or the artificial plaque color. No published laboratory methods for evaluating color change produced by peroxide containing products for topical application of toothpaste products where located in a search of the literature. Our efforts then focused on determining if a defined amount of toothpaste directly applied to the artificial plaque substrate under various conditions would produce reproducible whitening changes over time. Because whitening occurred as a result of a chemical interaction with the plaque substrate, rather than physical removal of plaque layers as produced by tooth brushing, efficacy was evaluated on a 0 to 2 score. This is referred to as the whitening index (WI). From the results of the studies conducted, direct application of toothpastes to a susceptible artificial plaque substrate coupled with the use of the WI can assess and compare whitening scores. The two hydrogen peroxide-containing toothpastes tested produced the highest whitening scores in the fastest possible time compared to the other products evaluated. One of the non-peroxide toothpastes tested, CP2, demonstrated a low whitening mean score which increased with contact time. It is not known why this occurred, however it may be due to the presence of the active agent Triclosan in this formulation. Additional evaluations are necessary to confirm this finding. The other peroxide-free toothpaste tested did not whiten the substrate and no WI score was determined in any of the time periods. The research conducted demonstrates that this new laboratory whitening method can be used to screen toothpaste formulations and to determine the ability of these toothpastes to release active whitening agents. The test method allows an assessment of whitening without the potential complicating effects of tooth brushing, or components such as abrasive, polishing, surface active or chelating agents in toothpaste formulations. 1. Eriksen, H.M., Nordbe, H. Extrinsic discoloration of teeth. (1978) J Clin Periodontol 5(4): 229-236. 2. Watts, A., Addy, M. Tooth discoloration and staining: a review of the literature. (2001) Br Dent J 190(6): 309-316. 3. Sulieman, M. An overview of tooth discoloration: extrinsic, intrinsic and internalized stain. (2005) Dent Update 32(8): 466-468. 4. Barbakow, F.H., Imfeld, T., Lutz, F., et al. Dentin abrasion (RDA), enamel abrasion (REA) and polishing scores of toothpastes sold in Switzerland. (1989) Schweiz Monatsschr Zahnmed 99(4): 408-413. 5. Hefferren, J.J. Historical view of toothpaste functionality methods. (1998) J Clin Dent 9(3): 53-56. 6. Fischman Sr, Yankell SL: Toothpastes and Mouthrinses in Primary Preventive Dentistry. Ed. N.O. Harris and F. Garcia-Godoy, 6th ed. (2004) Pearson Education 119-144. 7. Creeth, J.E., Price, K.S., Wicks, M.A. The stain removal performance of a new anti-hypersensitivity toothpaste. (2006) J Clin Dent 17(4): 106-111. 8. Fischman, S.L., Truelove, R.B., Hart, R., et al. The laboratory and clinical safety evaluation of a toothpaste containing hydrogen peroxide and baking soda. (1992) J Clin Dent 3(4): 104-110. 9. Yankell, S.L., Emling, R.C., Prencipe, M., et al Laboratory and clinical stain removal evaluations of two tartar control toothpastes. (1995) J Clin Dent 6(4): 207-210. 10. Amaechi, B.T., Higham, S.M. Development of a quantitative method to monitor the effect of a tooth whitening agent. (2002) J Clin Dent 13(3): 100-103. 11. Joiner, A., Thakker, G. In vitro evaluation of a novel 6% hydrogen peroxide tooth whitening product. ( 2004) J Dent 32(1): 19-25. 12. Pontefract, H., Courtney, M., Smith, S., et al. Development of methods to enhance extrinsic tooth discoloration for comparison of toothpastes. 1. Studies in vitro. (2004) J Clin Periodontol 31(1): 1-6. 13. Sulieman, M., MacDonald, E., Rees, J.S., et al. Tooth bleaching by different concentrations of carbamide peroxide and hydrogen peroxide whitening strips: an in vitro study. (2006) J Esthet Restor Dent 18(2): 93-100. 14. Lath, D.L., Smith R.N., Guan, Y.H., et al. Measurement of stain on extracted teeth using spectrophotometry and digital image analysis. (2007) Int J Dent Hyg 5(3): 174- 179. 15. Shi, X., Emling, R.C., Yankell, S.L. A new laboratory method for evaluating toothbrush efficacy. (1995) J Dent Res 74: 49. 16. Shi, X, Emling, R.C., Yankell, S.L. A new method for testing toothpaste abrasivity potential. (1996) J Dent Res 75: 46. 17. Yankell, S.L., Shi, X., Emling, R.C., et al. Laboratory evaluations of three dentifrices with polishing or brushing. (1998) J Clin Dent 9(3): 61-63. 18. Saxer, U.P., Yankell, S.L. A review of laboratory methods to determine toothbrush safety and efficacy. (1997) J Clin Dent 8(4): 114-119. 19. Data on file, University of Pennsylvania School of Dental Medicine, 2004-2006; YRC Inc., 2007-2015. 20. Yankell, S.L., Shi, X., Emling, R.C., et al. Laboratory evaluation of the Reach Tooth & Gum Care toothbrush and three additional manual toothbrushes for subgingival access. (1998) J Clin Dent 9(1): 1-4. 21. Yankell, S.L., Shi, X., Emling, R.C., et al. Comparing the Dr. Sedoc and ADA toothbrushes in three independent procedures. (2004) J Clin Dent 15(1): 33-36. 22. Barnes, C.M., Covey, D.A., Shi, X., et al. Laboratory evaluations of a bi-level extremely tapered bristled toothbrush and a conventional uniform bristled toothbrush. (2009) Am J Dent 22(2): 84-88. 23. Yankell, S.L., Barnes, C.M., Shi, X., et al. Laboratory efficacy of three compact toothbrushes to reduce artificial plaque in hard to reach places. (2011) Am J Dent 24(4):195-199.